Ice Melts & Spring Sprongs! SQUALL OPENS THIS Sat. Mar. 31 8 Days a Week! Our 33rd rip ’round the sun and what a planetary paddle it’s been. Feeling like yesterday when Kathy and I looked at each other at afternoon tea and said, “oh what the heck, let’s open a paddle shop”. I ain’t kidding – there was more thought put into what was for supper that night. On opening day, we had a bunch of donuts and borrowed a 60-cup coffee urn, brewing it to the brim. Four people showed up, two of them were friends from Kingston guessing we might be a bit short on customers. Another came out from town because we had a lifejacket for a door prize! Paddling Film Fest & Global Medic & $6000! A big Cole Lake thanks to all of you who pitched in. We raised over $6000 for Global Medic a short while ago in a fun, popcorn & beer-filled saturday night down at the Stockey Centre on Georgian Bay. Who says life is slow here? Trips & Courses ~ for June..
Current openings, hope you can join us, see our website for July & August paddling. 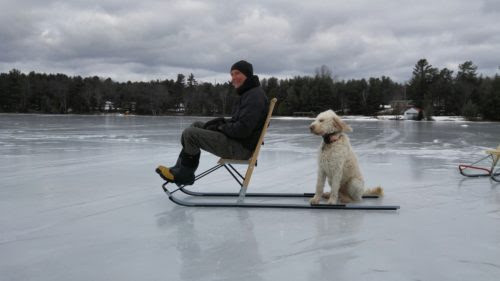 Things are sorta slow here in the winter I’ll have to say – so Charly and I have a bit too much time on our hands. Our first and possibly last effort to break in to the big leagues, so don’t hold your breath, just stand back and be amazed ~ Tim & Charly’s epic. Hoping to Find Outdoor Work THIS SUMMER?